Column: Rick Priestley, "This gaming life - It's a goal"
With more and more wargames styling themselves as ‘skirmish’ in type and intent, it’s certainly starting to look like a pretty crowded niche. What was once an occasional or minority interest is becoming practically mainstream. Considering all of these new and exciting developments, it does beg the question – exactly how big is a skirmish wargame? The remains of the Dutch 34th SS Volunteer Grenadier Division mount a last desperate defence of the area.Special: Piers Brand, "A bitesize battle for the capture of Arnhem - Clearing the tomb"
In April 1945, the Allied forces launched a sequence of operations, one of which was to secure the city of Arnhem, the site of the heroic stand by 1st Airborne Division during Operation Market-Garden in the previous September. A war correspondent who entered the city after its capture viewed the destruction and debris of the previous battle and likened it to ‘entering an ancient tomb’. Special: Joseph McCullough, "A Frostgrave mini-campaign with a difference - Warriors of Athena"
My own love of Greek myth comes from two sources. The first is the original 1981 Clash of the Titans film, which I watched way too many times when I was a kid. The other was the game Heroes of Olympus by Task Force Games, which also came out in 1981. Billed as a ‘role playing game’, the boxed set came with loads of hex maps and cardboard counters, which made it feel more like a board game, but the rulebook is a dense treasure trove of ideas for gaming in the world of Greek myth and includes its own extensive charts for determining the parentage of a hero. It is the best purchase I ever made in a $1 shop. Special: Dillon Browne, "The Romans march against Palmyra - Clubs versus kontos at Emesa"
Typical isn’t it? One of your favourite ancient cities stays out of the news for centuries, and then when it is on the news, you wish it wasn’t. The ancient city of the Palmyrans fascinated me when I first started playing wargames. Their daring stand against the Roman Empire had a romantic feel to it. This wasn’t the empire at its peak, though. It was starting to suffer from civil wars, invasions, and financial collapse. Perhaps with better luck, the attempted independent Palmyran state could have succeeded. Theme: Adrian McWalter, "Why wargame with a Napoleonic Russian army - Slavsya, Otechestvo!" This is something I always ask myself when I walk away from the wargames table following another defeat at the hands of the French. After all, Russian commanders were drunken fools and their troops lacked the natural aptitude for war that characterized the French soldier, as the British historian Francis Petre would have us believe. Yet I always return to my green-coated sons of Russia. Why? Well, let’s take a look. Securing the river crossing, they attack the Russians.Theme: Adrian McWalter, "The Battle of Gorodetschna - The Black Eagle's claws"
Having driven deep into Russia, Napoleon was on the brink of taking Smolensk. Nevertheless, to the south, Tormasov’s Third Russian Army of the West had become a real threat. On 27 July 1812, General Tormasov defeated Reynier’s Saxons at the Battle of Kobrin. To stabilize the situation, the Emperor ordered Schwarzenberg’s Hilfkorps to cooperate with Reynier and suppress this Russian threat. Obeying his political master’s instructions from Vienna, Schwarzenberg had so far avoided any serious or overtly aggressive engagement with the Russians. But since this was a direct order from Napoleon himself, the Austrian commander-in-chief now had no option but to act offensively. Theme: Eoghan Kelly, "Battles in the Khanates, June and July 1805 - The Russian Carrhae"
In 1805, while the situation in the Caucasus deteriorated, the continued rise of the new French Empire meant Russia had to keep a close eye on the West – especially their treaty obligations, following the bruising campaigns of 5 years earlier by Suvaraov. As a result, the forces available to the Russian commanders in the southern Caucasus were quite limited, especially as war with the Ottoman Empire seemed imminent as well. Theme: Michael Leck, "The Finnish War of 1808 - The boy versus the bear"
Sweden in 1807 faced an ultimatum. If it didn’t join the Continental System against Britain, Russia would be obliged to attack Sweden, under the terms of the Treaty of Tilsit (1807) with France. King Gustav IV Adolf of Sweden viewed Napoleon as the ‘Antichrist’ and Britain as his ally, so the King instead entered into negotiations with Britain to prepare a joint attack against Sweden’s old enemy Denmark. As a result, Russia launched its surprise attack at the end of February 1808 without a declaration of war. Theme: Michael Leck, "History and rules for Sharp Practice - The Swedish Army, 1805-09"
The Swedish army of the Napoleonic war was primarily an infantry force. The organization of the infantry regiments, battalions, and companies had not changed very much during the previous century, and neither had the battlefield tactics or the way the soldiers were recruited. Still, the allotment system (indelningsverket) and its part-time regiments dominated, complemented by a number of enlisted jaeger, artillery, and garrison regiments. For Poland and Poniatowski!Theme: Roger Murrow and Guy Bowers, "The fight for Utitsa and the southern flank - Borodino with a Polish twist"
The Battle of Borodino was fought on 7 September 1812 between Napoleon’s Grande Armée and the forces of Imperial Russia. The fighting involved approximately 250,000 troops, and both armies suffered a staggering combined 70,000 casualties, making Borodino the bloodiest battle of the Napoleonic Wars. Theme: Guy Bowers, "Collecting a Napoleonic Russian army - For mother Russia and the Tsar"
Imperial Russia had a large empire, which stretched from the Baltic to the Black Sea. Its army was vast and powerful, and it took the combined might of the French Empire with all of its allies (some reluctant, such as Prussia and Austria) to threaten Russian dominion. Still, the resulting invasion failed. Russia was truly a force to be reckoned with. 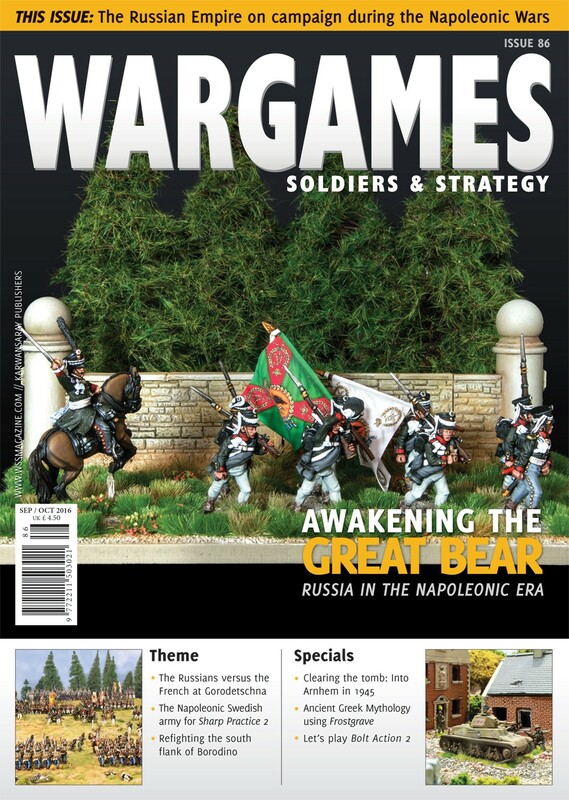 Theme: John Morris, "On the cover - 'Russian' to the front"
Not long before writing this, General Guy Bowersevich sent a rider to my studio, demanding a cover and article on the mighty armies of Tsar Alexander. I said “Yes”. I always do. There’s something about a heroic charge I can’t resist. They say that, in this life, if you’re not living on the edge, then you’re taking up too much space. Column: Colin Philips, "The irregular - Daniel is my brother"
So WS&S 85 arrives at work and I can’t wait to jump in and look at it. Why? Well firstly, my Zombie article, ‘Boarding the Blue Noah’, is in it in all its glory. Having only published a few articles in WS&S, the newness of having something printed has yet to wash off. And then, of course, I peruse the remaining articles. Hobby: Tony Harwood, "Building a Russian gun redoubt - A Napoleonic redoubt"
When Guy suggested that I build a Russian Napoleonic-themed piece of terrain for this issue, I started looking around for inspiration. A wooden church? No, I’d already built a church. A Russian windmill? No, I’d already built a windmill. What about a redoubt? Perfect, and I had most of the components I would need in my spares box. Hobby: John Bond, "Making realistic foxholes for World War II - No purple hearts for hiding in a foxhole!" The title of this piece was the cry that rang out from legendary US Marine Henry ‘Jim’ Crowe at Guadalcanal in 1943. But that’s what foxholes are designed for. Not so much for hiding as to stop you from getting a Purple Heart! They provide excellent cover – a great defensive platform from which to engage the enemy, while at the same time minimizing your exposure to enemy fire. Ancient Spanish warriors.Hobby: Ruben Torregrosa, "Painting Vixtrix ancient Spanish - Masters of Iberia"
The conquest of the Iberian territories by the Romans was definitely not easy, and more than one surprise was waiting for the invaders at the hands of the Iberians. In this article, I’ll show you how to paint these brave warriors, using the new outstanding plastic miniatures from Victrix. Let's play: Seb Burlage, "Bolt Action 2: Better than the original - Let's play Bolt Action 2"
As a self-proclaimed Bolt Action fanboy, I was very excited to receive version 2 rules to playtest. I couldn’t wait to see if any radical changes had been made or if some of the highly debated issues from the first edition were fixed. Happily, it appeared that I wouldn’t be disappointed. Reveiws: Stephen Luscombe and Eoghan Kelly, "Game reviews"
In this edition of game reviews, our writers take a look at The Kingdom is Ours, Baroque, and Over the Hills: A Napoleonic Wargame. Column: Richard Clarke, "Up front: The elephant in the room"
It was undoubtedly what a mate of mine calls a “Dakka Dakka moment”, when enthusiasm and pure joy of the game gets in the way of what, with a cooler head, we’d know was simply a bit daft. Personally, I reckon my opponent had been limbering up for our game by over-dosing on War Picture Library comics and their very charming brand of stiff-upper lip heroism which inspired many a schoolboy.